It's Better at the Beach! 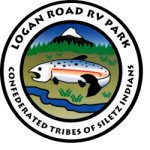 Logan Road RV Park is Lincoln City’s only RV Park west of Highway 101 where, “It’s Better at the Beach”. Amenities include access to Chinook Winds Casino Resort hotel spa and pool, free 24-hour shuttle service to Chinook Winds Casino Resort, Beach access only two blocks away, Chinook Winds Golf Course short drive away, free high speed Wi-Fi, free cable television and a grassy dog run. 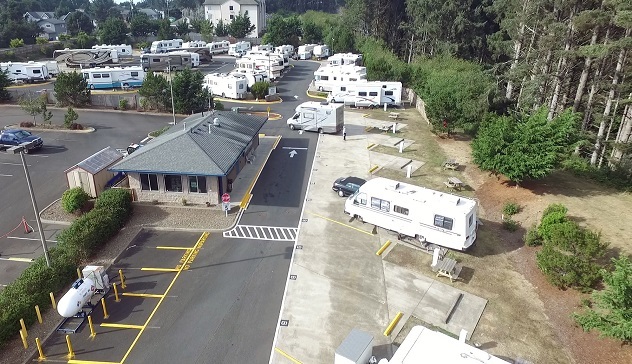 Take a look at our many amenities we offer both on-site and just a few blocks away at the Chinook Winds Casino Resort Hotel to include swimming pool and spa access for our guests. 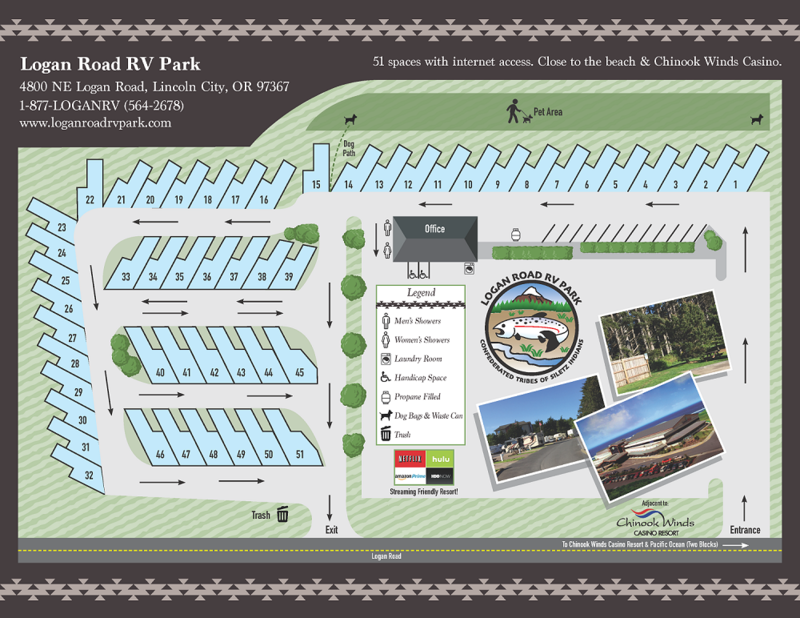 You can also see our park map to see if a particular site calls to you by clicking on the Park Map button below. With a newly upgraded 200Mbps synchronous up/down fiber circuit coming soon to the park you will be able to enjoy fast wireless internet including Netflix or simply plug your TV into our ready-to-go coax plugin and enjoy surfing 30 channels on TV while relaxing after visiting, eating and winning at Chinook Winds Casino Resort. The Casino offers over 1100 slot machines including a non‐smoking section and a high stakes lounge, buffet and Rogue River Steakhouse. Table games include Blackjack, Craps, Roulette and more plus a 1,000 seat bingo hall. 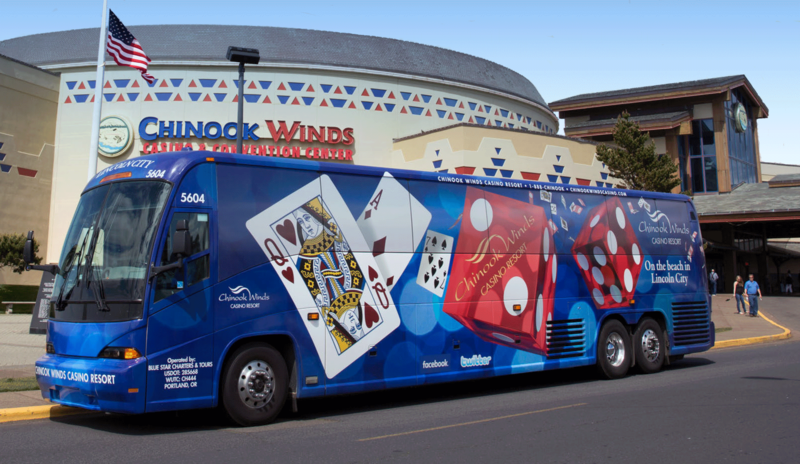 Chinook Winds Casino Resort is proud to offer headline entertainment monthly, comedy acts and signature outdoor events. With a combination of 51 sites that are up to 40’ by 15’ pull thru and 36’ by 15’ back-in and are available year round. 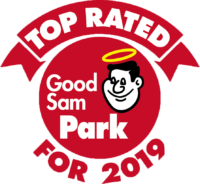 These sites include electric (30&50amp), water, sewer and coax television hookups along with a picnic table at every site, we have what you need. Have your best friend with you or perhaps a domesticated bird, cat or aquatic animal in an aquarium? No problem here! We have a wonderful dog run (and the beach is only a few blocks away) for you and your dog(s) to enjoy walks and play! See polices for more information. Chinook Winds Casino Resort, Taft 7-12, and the Lincoln City Cultural Center are continuing a commitment to support the awareness that we must prevent and stop child abuse. This is just one of many community events that will be taking place in Lincoln City in the coming week. This team of Tiger leaders were up early this morning to kick off Lincoln City Community Days! The group set up over 500 #PinwheelsforPrevention on the LC Cultural Center Lawn, to bring about awareness of child abuse in America.